If you're a follower of New Jersey politics, you've no doubt heard of the Eagleton Institute of Politics at Rutgers University. Located on the Douglass College campus at Wood Lawn, the Institute conducts research on the state's political climate and serves as the University's educational arm on public policy. Countless numbers of state policy makers, journalists and elected officials have benefited from the Institute's programming and resources, whether in undergraduate or graduate-level classes, or seminars targeted to segments of the public. I've always wondered who it was named for and why it happens to be headquartered on the campus of Rutgers' women's college. As I found from my research, both the setting and the focus of the Institute makes perfect sense once you learn its origin. The name and the heritage traces to a classic New Jersey Woman With Moxie who wasn't content to simply live the life of a member of late 19th-early 20th century Newark aristocracy. Rather than simply settle for luncheons and charity events, she became one of the state's leading advocates for women's rights in a time when change was neither guaranteed nor completely supported within her social stratus. Florence Peshine Eagleton was born in 1870 to parents whose families traced back to the earliest days of Newark's founding. Following her education at one of the city's exclusive finishing schools, her parents arranged her marriage to Henry Riggs, who at more than twice her age was already widowed and the father of a 20 year old son. According to Lives of New Jersey Women, their marriage, though without passion, resulted in one son, and they divorced as friends several years later. Though Riggs thought well enough of Florence to name her a beneficiary in his will after their separation, her own family disapproved of the divorce and considered her to be a fallen woman, in the parlance of the day. Her second marriage was far more successful. At the age of 43, she married Newark neurosurgeon Wells Phillips Eagleton, a far better match, both in age and mutual affection. They were an accomplished pair: he as a well-regarded and often-published physician and she as a philanthropist and advocate for social change. Florence had come of age during a time when the fight for women's suffrage and access to family planning were coming to a fever pitch. Already having helped found the New Jersey Birth Control League, she dove headfirst into the movement to ratify the 19th Amendment. As leader of the state's Women's Political Union and vice president of the New Jersey Woman Suffrage Association (WSA), she drove a hugely successful petition drive in Newark, prompting the state legislature to vote to make New Jersey the 29th state to ratify the amendment. That achieved, Eagleton became the first president of the Newark League of Women Voters, the successor to the WSA which is dedicated to educating voters about public policy issues. Under her leadership, the LWV conducted a series of "citizenship schools" to help women make better educated decisions at the polling place. The leap to the Eagleton Institute, then, becomes easy to understand, but why the Rutgers connection? An advocate of women's education, Eagleton was an early board member of the New Jersey College for Women (now Douglass College) and later became one of the first women to serve as a trustee at Rutgers University. She no doubt became intimately familiar with the school and saw a fertile field in which her life's work could continue well beyond her death. 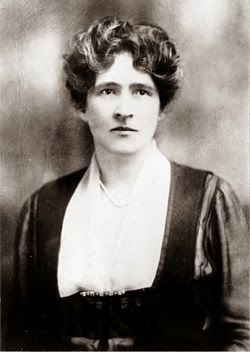 In her will, she bequested $1 million for the establishment of the Wells Phillips Eagleton and Florence Peshine Eagleton Foundation, directing that the funds go toward "the advancement of learning in the field of practical political affairs and government [so] that a knowledge of the meaning of democracy may be increased through the education of young women and men in democratic government." Further, she wrote, "It is my settled conviction that the cultivation of civic responsibility and leadership among the American people in the field of practical political affairs is of vital and increasing importance to our state and nation ... I make this gift especially for the development of and education for responsible leadership in civic and governmental affairs and the solution of their political problems." Florence Eagleton died in 1956 and the Institute was organized not long after. Now the home of the Center for American Women in Politics, it continues her efforts to build and enhance women's influence on the public policy stage, even as it broadens its scope to study immigration, the role of the governor in American states and a host of other issues. Perhaps Florence is little known today, but more importantly, her mission continues. 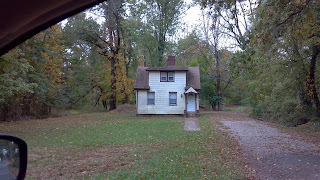 A few weeks ago we explored the Stelton area of Piscataway to tease out the history of early 20th century settlement there. You might recall we were trying to figure out the differences between Friendship Farm, the Ferrer Colony and an unnamed (at least to us) community of chicken farmers. Distinguishing one from the other proved to be a little bit of a challenge, as many sources refer to Friendship Farm and the Ferrer Colony in the same breath. In truth, they were quite different. While Friendship Farm was largely the province of formerly-urban and taciturn German transplants, the Ferrer Colony took a decidedly anarchist turn, fostered by adherents of Spanish educator Francisco Ferrer. Well-known for his political beliefs, Ferrer had founded the Escuela Moderna in Barcelona in 1901 as a means of promoting the tenets of anarchism. After he was executed for his alleged participation in an insurrection, free-thinkers around the world, including some in New York, sought to perpetuate his teachings through additional Modern Schools. in the former Ferrer/Modern School Colony. The prompt for the Modern School's move to Stelton came through two sources: a vision and a bomb. Troubled by the "evil influences" of the city, founders of the New York Ferrer movement theorized that they'd be far better able to effect social change if the school was physically cocooned within a supportive community of like-minded individuals. Meanwhile, students from the school's adult classes were linked to a 1914 explosion that was said to be a bomb intended for the Rockefeller family. Overall, Manhattan was turning out not to be such a great place to be an anarchist. Not long after the blast, one of the Ferrer group leaders was visiting friends who lived at Friendship Farm when an a solution materialized. Dissatisfied with the Farm's conservative environment, one friend suggested that the New York group could purchase the adjoining land and start their own settlement in New Jersey. One of the Ferrer Colony's remaining tiny houses. Compared to a cramped existence in Manhattan, the Stelton farmland must have appeared as nirvana. The Ferrer group bought 143 acres of land and subdivided it into one- to two-acre plots to be sold at a profit to individual members. Sale proceeds would be used to construct roads and other shared facilities. Like their Friendship Farm neighbors, the Ferrerists built their own homes; many were, by today's standards, ridiculously small (as in, they make the classic Edison concrete houses look like McMansions). The land itself was reportedly treeless, dusty and devoid of a water source. Roads were meant to be built as a communal effort, which didn't work quite as cooperatively as the founders had envisioned. Common facilities, like a dormitory for students coming in from New York, were only completed after severe financial difficulties. Through it all, the ever-important Modern School attracted the support and attention of parents who wanted their children to benefit from a progressive, if not revolutionary education. The school had no curriculum or study requirements, supporting the community's belief that allowing students to make their own choices would result in responsible adults. After a brief morning gathering, kids could experiment with several options, including outdoor games, woodworking and art. Traditional academics were available but not forced; oral histories note that some children didn't learn to read until they were nine or ten years old. The school and community persisted through the lean years of the Great Depression, losing many students whose parents couldn't afford tuition or had become communists. World War II seems to have struck the death knell; the construction and operation of nearby Camp Kilmer reportedly brought crime and hostility to what had been peaceful farmland. Nonetheless, the Modern School managed to stay open until 1953, most of its few students reportedly around kindergarten age. Today, the only overt sign of the Modern School is a plaque erected on the site where it once stood, 79 School Street. 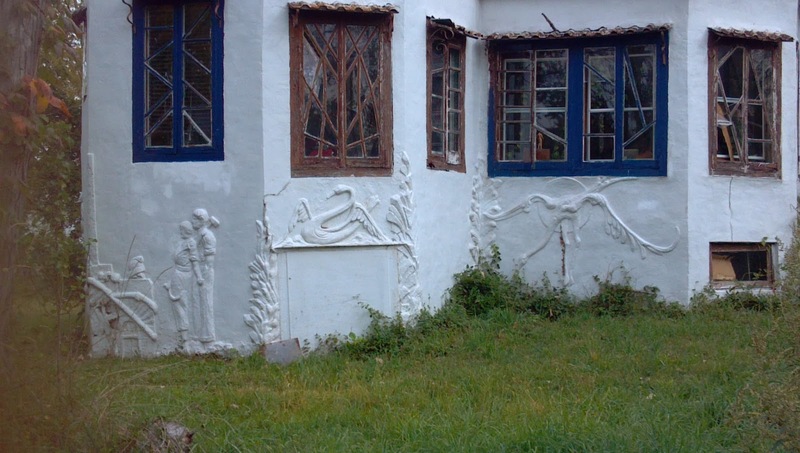 Though many of the common buildings have been torn down and replaced by retail establishments, some of the small houses still stand in the general area, including the Russian, or Goldman house, notable for the bas relief artwork on its outside walls. Sunbathing on the beach in November? In New Jersey? Apparently the tundra-like atmosphere that makes our beaches appealing to only a hearty few New Jerseyans in November also makes them a favorable sunbathing spot for rare visitors from the north. No, I'm not talking about the Benny, the much-maligned city dweller come to give the Jersey Shore a bad name. I'm referring to a much more refined creature, the snowy owl. Two were reported to be in various spots on Sandy Hook last week, and Ivan and I made our way there to check them out. Owling -- as birding for owls is known -- is generally a distinctly different art than the search for, say, songbirds. It's got its own traditions and etiquette, and birders rarely report the exact location of one of these iconic raptors, for the owls' safety. Active largely at night, most owls obscure themselves during the day to avoid attack from predators. If they feel harassed by individuals or groups of people standing within a certain range of their roosting spot, they're likely to attempt to find another secluded perch to rest on, and in the process, reveal themselves to predators. Snowy owls differ in that they tend to be 'out' during the day, often roosting on the ground or a low perch. The only other one I've seen was actually on some distant riprap at Round Valley Reservoir a few years ago. Thing is, if they've gotten as far south as New Jersey, there's a good chance they're exhausted from their long journey from the Arctic and deserve a good, solid rest without being hassled by a bunch of people. Thus, while general locations are often shared, birders generally know to give the owls a wide berth, observing from a hundred feet or more away. The snowys at Sandy Hook had been reported from several locations along the ocean beach, from just north of the park's entrance gate, to the most currently accessible northern end of the hook at Fisherman's Trail. We figured we'd scope for birders from the hawk watch platform at Battery Peck and adjust plans from there. Our view from the deck yielded some success, but not the kind we really wanted. A large group of birders was on the trail, but headed back toward the parking lot, having not seen either owl. We continued scanning for a few minutes from our elevated perch but saw no signs of the birds. The next stop, on North Beach, was the spot, as we could tell from the many cars in the nearby lot. As we walked along the sandy path toward the beach, we started seeing small clutches of binocular-toting people in various areas, all facing in the same direction, some with spotting scopes, a few with cameras. "Looks like the owl is here," Ivan said. More or less in the center of the rough circle was what, by bare eye, appeared to be a white and gray lump or small sand dune. 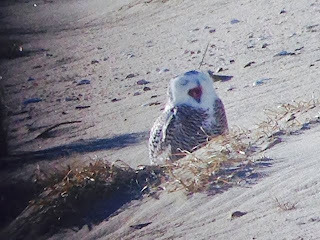 Focusing through binoculars brought a clearer view of a relatively dark snowy owl, head turned away from us. Occasionally it would shift position slightly, or turn its head to face us before looking away once more. The other reported snowy was nowhere to be found. By day's end, we heard that there were two other snowy owls spotted in New Jersey -- one near Barnegat Light and another in National Park, along the Delaware. Why are they here, and so many? Opinions vary. It's possible that there's a shortage of their normal prey of lemmings in their traditional wintering grounds in Canada. Or perhaps so many owlets were born this spring that adults are forcing the newcomers south to find winter territory. In either case, snowys are rare but not unheard of in New Jersey, so we can enjoy them, from a distance, for a brief period of time. And apparently Sandy Hook's Canadian visitors are learning the pleasures of visiting our shores without the frustrations of having to purchase a parking pass or, farther south, a beach badge. They'll be long gone and home before anyone stops to check. We like to say that Hidden New Jersey is often a scavenger hunt. Sometimes we know the quarry when we set out on our journey, as when we're seeking out a rare bird reported at a certain location. Other times, we find history along the way and end up discovering much more during the follow-up research days or even months later. Sometimes we unearth interesting coincidences, other times mysteries. This story is a little of both. It all started on a trip to the cemetery in Belvidere in late summer. Ivan and I were wandering around when I noticed interesting inscriptions on two stones, one a family marker and another for one of the family members, erected nearby. 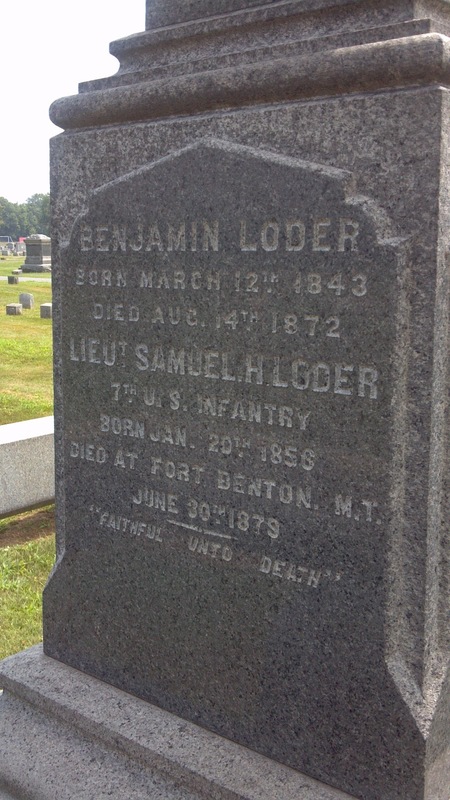 Given the detailed description, the place and circumstances of Lieutenant Loder's death appeared clear. He'd taken part in the U.S. Army's repeated battles with the Sioux Indians, served gallantly and apparently perished in one of the skirmishes, his remains returned to his birthplace in New Jersey. 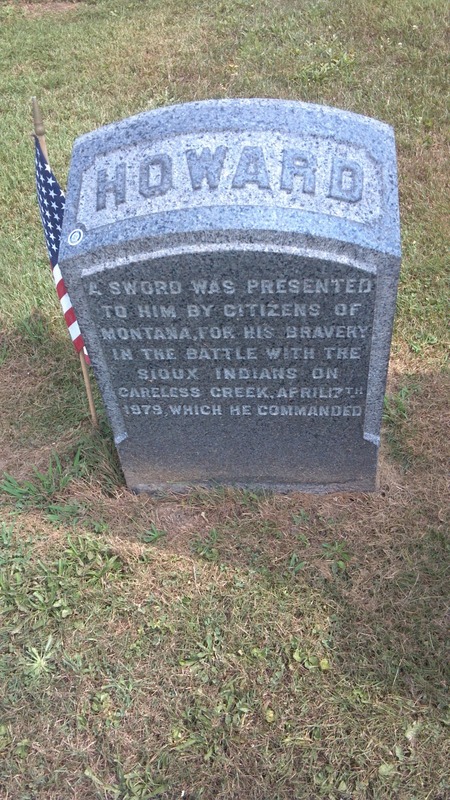 It also appeared that his family called him Howard, perhaps to differentiate him from another Samuel, maybe his grandfather, buried nearby. 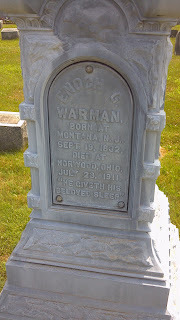 Then I found this grave marker, not far away, noting another individual's birthplace in Montana, NJ. I was left with two stories to work out. First, how did Lieutenant Loder die, and second, where in heck is Montana in New Jersey? Was this just an odd coincidence, or do the two have anything to do with each other? Finding cursory information on Loder proved to be reasonably easy. After graduating near the bottom of his class at the U.S. Military Academy in 1877, he was sent west and eventually assigned to Fort Logan in frontier Montana. At the time, clashes with Native Americans were regular occurrences in the area, with opportunities for injury and death. Several sources note the April 1879 conflict with a small group of Lakota Sioux at Careless Creek near Ryegate, Montana. According to government records, Loder, 18 men under his command and two Gros Ventre Indians confronted eight natives who were said to be connected to Sitting Bull. A 90 minute battle ensued, in which all of the Lakota were killed. None of the accounts of ensuing conflicts in the area make mention of Loder, which seemed rather strange. If he'd performed so heroically at Careless Creek that the local white settlers presented him with a gift, wouldn't he have led other battles? Had he died some way other than through combat? The 1880 U.S. Army Register notes simply that he died at Fort Benton, Montana on June 30, 1879, with no further explanation. Could it have been illness that did him in? It's well known that in many wars, disease killed more soldiers than weapons did. Did frontier outposts suffer the same issues? Could there have been an outbreak of some sort that led to Loder's demise? Unfortunately the circumstances of his death were tragic in another way. A July 6, 1879 New York Times article reported Loder's suicide as the lead in a story chronicling several people around the country who had died by their own hands. He'd shot himself in the head while in his tent at Fort Benton; the Times noted that "It is asserted that he had been drinking freely of late." It could have been an accident or intentional, we don't know. The details remain a mystery, perhaps buried somewhere in a report deep in old Army records, if not only with Loder himself. The grateful people of the Smith River Valley in Montana territory didn't have the opportunity to show their full appreciation to the lieutenant before his death, but they made sure his family knew what he'd meant to them. A year later, they presented a ceremonial sword to the Loders, along with a letter eulogizing the young lieutenant. 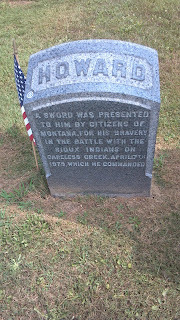 The sword was inscribed, "Presented to Lieut. Samuel Loder, Seventh United States Infantry, by the citizens of Smith River Valley, for especial gallantry in his fight with the Sioux Indians on Careless Creek, Montana Territory April 17, 1879." Hopefully their regard brought some measure of comfort to the Loder family, who clearly wanted their son's achievement to be known for perpetuity. As for the mystery of Montana, New Jersey? I'm still working on that one... story to come. It's hard to fathom now, but 90 years ago, commercial radio was little more than a novelty. Barely past making a sizable investment in a phonograph player, many families were wondering whether it made sense to buy a receiver to listen to one of the few broadcast stations on the air. People got their information from print newspapers and magazines, or from their friends, and the concept of hearing the words of a far-away singer was mystifying. Why would they sink more money into a new gizmo they didn't really need? Businesses were facing a similar quandary from the opposite side of the transaction -- a chicken-and-egg dilemma of sorts. Retailers couldn't sell radios if there was nothing being broadcast for people to listen to, and owning a radio station was a risky proposition unless a good number of people had the instrument to pick up and follow your signal. A few brave entrepreneurs, however, decided to take the plunge, among them Newark's Louis Bamberger, owner of New Jersey's largest retail establishment. Already selling phonographs and recordings when commercial radio was introduced in the early 1920s, he saw the potential for radio to be just as big, perhaps even bigger. After all, it could deliver inexpensive entertainment that would never get boring. Unlike a phonograph that required the purchase of new recordings from time to time to stave off monotony, radio offered the prospect of free and varied programming once consumers purchased the receiver. sporting the massive WOR antenna. Supplying that programming was the next step in the equation. Imagine how easily Bamberger's employees could sell receivers if the store were to operate its own radio station! Even better, what if it was so close that the signal couldn't help but come in loud and clear? Bamberger decided to find out, in the process founding one of New York City's most enduring radio stations. 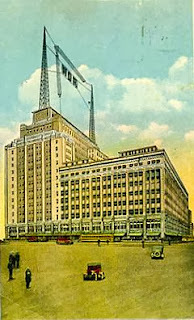 From a small studio on the sixth floor of its flagship Newark store, Bamberger's made history on February 22, 1922, broadcasting Al Jolson's "April Showers" on a 500 watt signal on radio frequency 833 AM. Rather than getting the "WLB" call letters he had hoped for, the new station was assigned "WOR," the letters previously designated for the ship U.S.S. California. Within a year, WOR was demonstrating the power of radio so successfully that Bamberger considered shutting it down for fear it would hurt phonograph sales. Others suggested that he should take a broader view, encouraging him to consider the broadcasting industry as a growth opportunity in its own right. WOR opened studios in New York to supplement its Newark facilities and eventually expanded its reach with a 50,000 watt capacity. The Bamberger Broadcasting Service became a key member of the Mutual Broadcasting System, broadening the influence of radio nationwide during the mid-20th century. WOR left Newark for good in 1941, and few people remember its New Jersey roots. Bamberger's itself was sold to Macy's in 1929, eventually taking the corporate name in 1986 and closing the Newark store in 1991. Interestingly, in the years since, the old flagship location has returned, in a way, to the business of dispatching information. Its sturdy construction makes it an ideal site for telecommunications equipment and computer server farms, an unintentional though apt link to the early days of much simpler though still astounding means of sharing information. Bad planning is often the route to an excellent road trip. Usually when I head out on my own, I aim for one key location, anticipating that other equally interesting finds will pop up along the way. When planning the Paulsboro trip, I cheated a little and researched a few more possible destinations before I left Hidden New Jersey headquarters. Well, it's not cheating as much as preventing future remorse: there's nothing quite as frustrating as coming back from a road trip, only to discover you were two blocks from something totally astounding. I was hoping a little extra prep would pay off. At the very least, I figured I'd find the places and decide whether they warranted further research and a return visit. Those opportunities blown, it was time to riff. Shaking off my gaffe, I buzzed past the diner where I'd had the Taylor ham/pork roll debate, through Mullica Hill and then southwest. Signs started pointing the way to towns with familiar names: places I'd been past, but never through. Woodstown fits into that category. I'd seen plenty of signs pointing in that direction on my many trips through Salem County, but in my mind, it was just a collection of farmland with no discernible population center. It was time to find out what's there. I hit paydirt before I got into town. At the intersection of Route 45 and Bypass Road, I saw a cluster of white cinderblock buildings, low and long. The short end of the building closest to the intersection was labeled with faded painted lettering reading "EARL L. ERDNER. WAREHOUSE No. 11 CANHOUSE BROKERS." What's a canhouse broker? Given the farmland I'd just driven through, did it have something to do with the local harvest? Had these been processing facilities and storage for canned food? The mystery got even more curious as I continued driving. The long side of the building, running along the road, held faded lettering, looking much like calligraphy. Rather than the loopy ramblings one sometimes sees in roadside signs, these sayings seemed to be life lessons, perhaps coined by Mr. Erdner himself. No one would ever confuse the plains of Southwestern New Jersey with the Himalayas, but had I stumbled upon the works of a Garden State Guru, the Sage of Salem? I pulled over to take a look, and a few photos. "Life is like an exciting book and every year a new chapter." "Anyone who thinks he is indispensable should stick his finger in a bowl of water and notice the hole it makes when he pulls it out." "Keep your troubles to yourself and make people believe you're having a wonderful time." "Rise to the occasion. But know when to sit down." 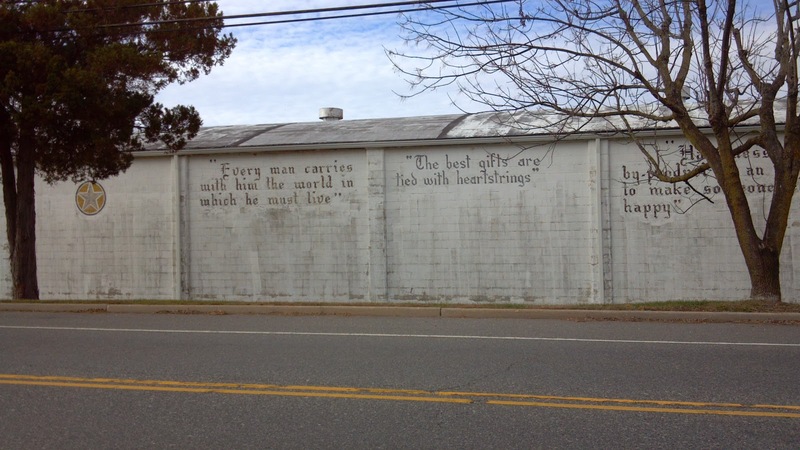 As you can see from the photos, the paint is fading, the sayings along with it. Erdner died years ago, apparently without finding someone to maintain his wise sayings. Who knows -- maybe he'd have preferred it that way, allowing his words to fade from memory as if they'd never been written. For the time being, at least, they're there for passers-by to read if they want to take the time to stop and hunt them down around the property. 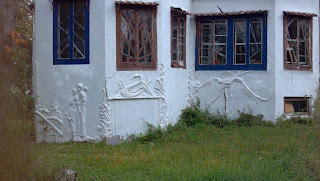 Whoever now owns the property hasn't whitewashed the wisdom over, and I'm told that many more sayings can be seen if you walk around the buildings to look. Maybe they don't reveal the meaning of life, but you could do a lot worse. And they're a thought-provoking welcome to what's a very lovely town. 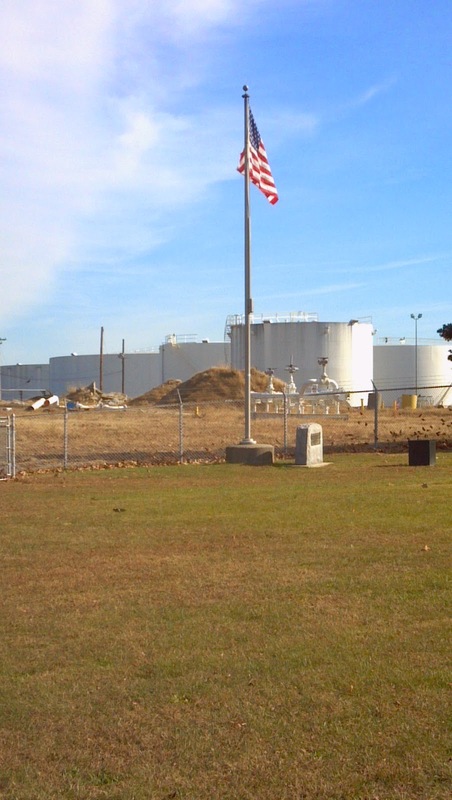 You wouldn't know it from its neighbors, but a small park tucked between two oil refineries on the banks of the Delaware River has a very distinct place in American history. Not only is it the site of a Revolutionary War fort, it was the very first land purchase made by the United States Government. Fittingly, I decided to visit on Veterans Day. On first glance, Paulsboro wouldn't seem to be the place for an 18th century historic site. Downtown has seen better days, houses are tightly packed together and as you get closer to the riverfront, you're addressed by the sights and smells of the refineries that sit on the shoreline. I'd heard somewhere that years ago Standard Oil had placed a monument at the site of Fort Billings on or near its own property, so I was hoping that it was now a publicly-accessible site. That it is, and well marked. Heading westward from downtown, I reached the end of North Delaware Street to find this sign at the entrance to a park. In the distance, beyond a small playground and pavilion, I could see a flag flying in the breeze. 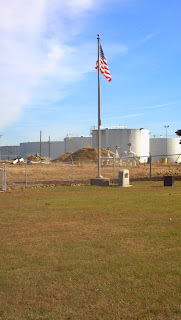 Getting out of the car, I was immediately hit by refinery odors, but as I walked toward the flag, the smell dissipated in the breeze. Maybe it wouldn't be so hard to imagine the fort, after all. Fort Billings is essentially a small but integral part of the story of the little known Battle of Red Bank and, ultimately, the defense of Philadelphia during the Revolution. 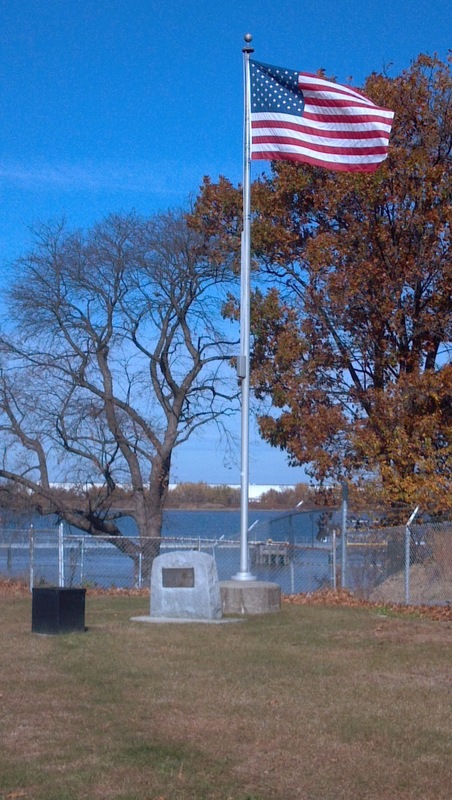 The site was originally purchased from the Paul family (of Paulsboro fame) by the Council of Safety of Philadelphia and billed to Congress on July 5, 1776. 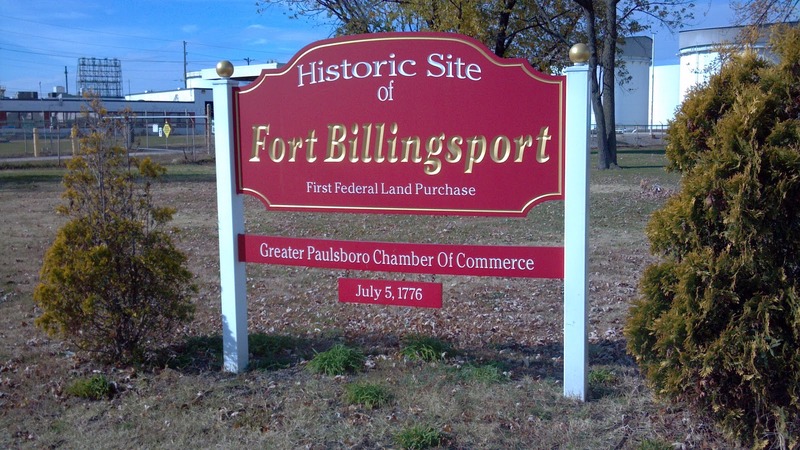 Less than a year later, Fort Billings (or Billingsport, depending on your source) was built under the guidance of General Thaddeus Kosciusko in his first engineering assignment from Congress. Located four miles south of Red Bank's Fort Mercer, it was one of three installations built to protect Philadelphia from a British naval invasion. Soldiers stationed at the fort submerged obstacles called chevaux de frise strategically in the river to damage the hulls of any enemy ships that might try to venture up the river. Billings also maintained a signal cannon as part of the American army's system to warn other forts of an approaching British attack. 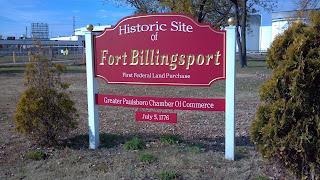 Fort Billings' history was relatively brief but notable. Thinking twice about the substantial obstacles blocking their entry by water, British forces approached Philadelphia by land instead, eventually taking the city on September 26, 1777. They still had one major problem: as long as the Delaware was inaccessible, supplies couldn't reach the city. General William Howe, commanding the British forces, ordered the destruction of all American defenses along the river, and Billings was the first target. Though New Jersey militia fought bravely, they were unable to stop the British approach on Billings a few days later. General George Washington ordered the evacuation of the fort, and on October 2, Continental Marine Lieutenants William Barney and Dennis Leary safely brought the 112-man garrison and its ammunition on board the Andrew Doria for transport across the river to Fort Mifflin. To ensure that the British wouldn't be able to easily capitalize on the fort's strategic position, a small group stayed behind to render the cannons unusable and burn down the fort. Close to finishing their duties when the Redcoats arrived, the Americans exchanged gunfire with the enemy briefly before jumping into the last rowboat to make their way to safety. There's not much at the site now to tell the full story or connect it with the better-curated Fort Mercer site in National Park. 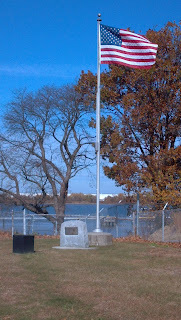 One memorial notes the presence of the fort, while another recognizes Leary and Barney for leading the evacuation of 112 men but says nothing of the impact in saved lives. A third plaque from the Copernicus Society notes Kosciusko's contributions as a military engineer. Though all evidence of the fort itself is gone, we can be happy the name and these few acknowledgements are on site to pique curiosity and interest among those who don't know the story. New Jersey's 19th century industrial history seems loaded with stories of quirky people who built communities around their factories. Such was the story of Eastampton's Hezekiah Smith. Part inventor, part manufacturer, Smith came to New Jersey in 1865 from New Hampshire, seeking to start an ideal company town. He found a fertile site at Shreveville, Burlington County, a former cotton spinning and weaving factory town that had gone belly up, its water-powered mills rendered obsolete by the introduction of the steam engine. Seeing a good deal, Smith purchased 45 acres of the property from the Shreve family for $20,000. Within 10 years, he'd incorporated the H.B. Smith Machine Company and created housing and amenities to accommodate 250 people. The new community of Smithville included housing, a school and stores in addition to a foundry and factories to manufacture tools and woodworking machinery. Resident workers could enjoy a number of civic and cultural events and resources around town. Smith must have been a fair employer and a well-regarded member of the community, albeit a bit unconventional. In 1878 he won a seat in Congress after campaigning on a carriage pulled by a moose. Wisely seeking to diversify the business, Smith cast about looking for additional industries to tackle. On the advice of Smith Machine board member J.J. White (of cranberry fame), he entered into a licensing agreement with Hammonton native G.W. Pressey, who'd recently patented a revolutionary adaptation to the high-wheel bicycle. It literally turned cycling in the opposite direction, with a ratchet drive that put the larger wheel in the back and delegated the smaller front wheel to steering. The arrangement was said to provide greater stability, a selling point Smith later advertised by paying a demonstrator to ride the bike down the steps of the U.S. Capitol. Suddenly, cycling was the focus at Smith Machine, where the newly-formed American Star Bicycle Company perfected Pressey's design and modified the factory to make the new product. Smithville became New Jersey's Bicycle Town as orders poured in for the cycles. Meanwhile, employees enjoyed an innovative new way to get to work. Arthur Hotchkiss developed the world's first bicycle railroad between Smithville and Mount Holly, where many Smith workers lived. The 1.8 mile system was essentially a monorail, with the bicycles hanging from a rail suspended about four feet above the ground. Given the lack of paved roads at the time, the system probably gave a much smoother ride than they would have had by traditional means. Several hundred of the Pressey-inspired bicycles were made before production halted in 1886, but Smith continued to develop new transportation technologies until his death. Besides innovations in standard bicycles, he invented a steam-powered version (motocycle), roller skates and even a helicopter. It's also said that he invented a steam-driven wagon but deemed it too modern for contemporary tastes. Smith's story, so far, is one of a driven businessman who built a prosperous community and likely helped improve the lives of many. Perhaps the moose and Capitol stunts indicate a bit of showmanship, but not so much as to be quirky, as I described him in the opening words of our story. What, then, could warrant calling him quirky? Maybe the best way to start is to note the brevity of his Congressional career: just a single two-year term. It seems that as soon as Mr. Smith went to Washington, ghosts of his past came to haunt him, a scandal that would warrant tabloid headlines even today. Smithville residents knew his wife to be Agnes Gilkerson Smith, the woman who'd moved to New Jersey with him from New England. Some might have even known that Smith had funded Agnes' education at the University of Pennsylvania Medical School, but likely very few if any were aware that Smith had also sent her to a finishing school before that, having met her when she worked in a mill in Lowell, Massachusetts. Agnes was, in fact, Smith's second wife, and he'd never bothered to legally divorce the first one. He'd met Eveline English in Vermont, and it's not clear whether the pair had ever actually married; some accounts say he'd brought up the idea to her parents a few times but never quite got around to arranging a ceremony. When he decided to seek his fortune in New Hampshire, he took Eveline along, and three months later their first child was born. About a year later, Eveline moved back to Vermont, and the couple never lived together again, though they had three more children over the following seven years. In that time, Smith moved to Massachusetts to open a machine shop. 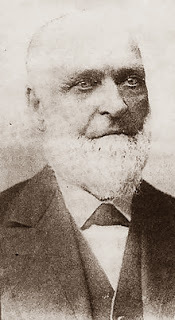 Smith's relationship with the Vermont family eventually deteriorated to the point where it was based mostly on financial dependency; the timing suggests his meeting Agnes played a big role there. When she returned to Lowell from Philadelphia, the pair began living together, much to the disapproval of their neighbors. They were shunned and excluded from social functions, making life in town pretty miserable. The best option, it seemed, was to start a new life elsewhere. Shreveville, in South Jersey, must have looked ideal: it was far enough away that no-one would know Smith's past, and there was sufficient room to build an entire industrial community. Before leaving for New Jersey, Smith made one last visit to Eveline, this time to demand a divorce. She refused outright. Lacking her permission to take the legal route, he devised his own very creative approach to severing the relationship. If he couldn't get the papers proving they were divorced, he'd expunge all evidence they'd ever been together. He burned every letter she'd ever written him and then went to her sister's house to cut every reference to their marriage and children out of her family's Bible. Whether it was to buy her silence or out of common decency, he signed the family house over to Eveline and opened a bank account for her in her maiden name. Then he was off to New Jersey. Smith's bigamy might have stayed a secret forever had he not run for national office, but within two weeks of his election, the word was out. Newspapers carried interviews with Eveline and some of their children, and despite the overwhelming evidence, Smith chose to simply deny everything. The hubbub over the discovery eventually dissipated, but his constituents declined to return him to Washington in 1880. Then again, voters might have been more forgiving than the election results indicate. Some historians have noted that his Democratic party affiliation could have foretold his defeat in a year when the Republicans regained control of the House of Representatives. And three years later, he was elected to a single term in the New Jersey Senate. To many people, the name Joyce Kilmer means one of three things: the poet who wrote Trees, a rest area on the New Jersey Turnpike, or an army base that once operated in Edison. If you've lived or gone to school in New Brunswick, a certain street might come to mind, too. And if you've walked down Joyce Kilmer Avenue, you might have noticed a small cream-colored house with a plaque saying, simply, "Kilmer House." Its first floor now the home of the city's Dial-a-Ride program, the upper portion of the house quietly remains a shrine to the poet and World War I hero. The facade of the house is a puzzle, with no indication of whether any aspects of the family's life there have been preserved, or when one might be able to return to learn more. A bit of sleuthing revealed contact data for New Brunswick Historian George Dawson, who kindly agreed to meet me there and share some insights on the family and the house. Alfred Joyce Kilmer was born in the front bedroom of the house in 1886 and was baptized at Christ Church, his first name taken in honor of the parish curate and his middle name from the Episcopal rector, Rev. Elisha Brooks Joyce. His parents, Frederick and Annie, had moved to the house at 17 Codwise Avenue a few years earlier, and Fred operated a pharmacy downtown until 1889, when he joined a new company called Johnson & Johnson as its first scientific director. Taking the job at J&J appears to have been a wise move for Fred; when Joyce was just five years old, the family moved to a larger house on College Avenue. (Regrettably, that house was demolished in 1960 to make room for the uninspired architecture of Brower Commons.) Fred went on to develop the company's iconic baby powder and contribute to several other advancements; check out J&J's informative Kilmer House blog for more on his fascinating career. After completing his primary and secondary studies at Rutgers Preparatory School, the younger Kilmer attended Rutgers College, where he was an associate editor of the Daily Targum and a member of Delta Upsilon. Writing came easily to him, math not so much. At the time, college regulations required that students pass all of their subjects before being allowed to move to the next year's studies, and poor grades in sophomore mathematics meant he'd have to retake all of that year's classes before advancing. Instead, he chose to complete his studies at Columbia University, where, it might be presumed, the policies were a little less rigorous. From his earliest years, Kilmer was deeply spiritual and eventually converted to Catholicism, prompted by his interest in Irish heritage and nationalism. He's also said to have told friends that Catholics write the best poetry. He married Aline Murray in her home Episcopal parish in Metuchen in 1908, but by 1913, the couple were members of New York's Roman Catholic Church of St. Paul the Apostle. Kilmer graduated from Columbia in 1908 and taught English and Latin at Morristown High School while working to make his mark in New York's literary community as a reviewer. Stints at publishers eventually brought him to the New York Times Sunday magazine, even as he published several volumes of poetry. He and Aline moved to Mahwah, where they welcomed a son and daughter, and where he's said to have written Trees. Having joined the New York National Guard's 69th Regiment in 1914, Kilmer became part of the regular army after the United States entered World War I. His feelings about war were evident in his poem The White Ships and The Red, published by the Times after the sinking of the Lusitania. Despite his college education, he chose not to pursue an officers' commission and went in as a private. He shipped out to France in October 1917 and was promoted to sergeant five months later. 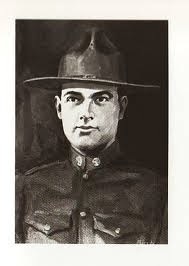 On July 30, 1918, he was killed in action, shot in the head by a sniper. Only 31 years old at the time of his death, he was buried in a military cemetery at Fere-en-Tardenois and remembered by his commanding officer, Lieutenant Colonel William Donovan, as "a cool-headed solider... full of eagerness at all time to give his full measure of service." The French awarded him the Croix de Guerre posthumously in recognition of his valor. Back in New Brunswick, the local American Legion post wanted to honor Kilmer, the local enlisted man who'd served so honorably. The Codwise Avenue house had passed through several owners since Fred and Annie sold it in 1903, and the Legionnaires felt it would be an ideal home for their post. They bought the property in 1929, dedicating it the next year with a blessing on the birthplace room from a Christ Church rector. It was henceforth known as the Joyce Kilmer Shrine. 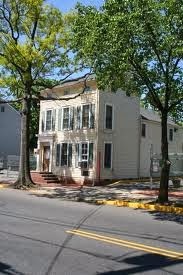 Declining membership, vandalism and rising maintenance costs forced the Joyce Kilmer Post 25 to sell the building to the state as a historic site in 1969, and local historians created the Joyce Kilmer Birthplace Association to drive restoration. The city of New Brunswick took possession in 1983, with the stipulation that the second floor shrine be maintained. Few people visit the house, as evidenced by the number of signatures in the guest book. You'd hope that local schools would arrange field trips so kids could learn a bit about a local writer and war hero, or that Rutgers might encourage English or Journalism students to stop by. In any case, if your curiosity is piqued, mark December 6 on your calendar. The house is open every year on Kilmer's birthday, and you're more than welcome to stop by and learn more about this hidden but not really hidden New Jersey notable. Benjamin Franklin famously likened New Jersey to a barrel tapped at both ends, referring to its proximity to Philadelphia and New York. Some have decried the statement as an insult, but few realize that the Founding Father actually played an influential role in colonial New Jersey. of Ben Franklin look like Bob Newhart? The city of Burlington makes much of its connection to Franklin, beginning with his first visit to the city in 1726. According to a diary entry from his return home after a journey to London, Franklin was briefly delayed in Burlington when he missed a connecting boat across the Delaware. He stopped at the Revell house to buy gingerbread for his trip, and when he discovered his boat had already left, returned for advice on alternate travel options. While serving him a fine dinner of ox cheek in return for a pot of ale, the (unnamed) lady of the house encouraged him to stay in town and open a printing shop. Undeterred from reaching his ultimate destination, he was able to secure passage on another boat later that day. The Revell house still stands and is said to be the oldest house in the county, having been built in 1685. 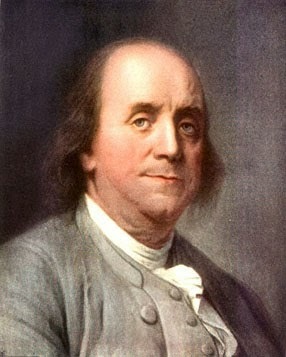 While he opted not to set up shop in New Jersey, Franklin became a well-known printer and publisher in Philadelphia. Perhaps influenced by the potential benefits to his trade, he became a major proponent of paper money, writing persuasively on the benefit of printed notes versus gold and silver coin. In the late 1600s and early 1700s, paper notes were used largely in times of emergency and were printed with expiration dates. Colonies eventually began issuing permanent paper currency, and Franklin was instrumental in the design of the notes authorized by the New Jersey Legislature in 1728. He returned to Burlington to use Isaac Collins' copperplate press to print what the city's historians say was the colony's first colonial currency. Interestingly, he later chose New Jersey currency as the first to incorporate an ingenious counterfeiting prevention feature: the transfer of a sage leaf pattern to the reverse side. Beyond his contributions to the financial system, Franklin later became New Jersey's agent in London. Yes, you read that right: Ben Franklin was a lobbyist. Having secured his son William's appointment as Royal Governor in 1763, Franklin returned to London the following year to represent Pennsylvania, New Jersey and a handful of other colonies to the Court. He built and maintained several useful relationships there until 1775, when conditions between the colonies and the Crown had deteriorated badly.